Remember Anchiornis and Archaeopteryx? Probably not since they died before even I was born... 152 million years ago. They were the roots of bird family we know as Chickens. Massimo Rapella would like to roll back a bit of that descendancy. A few months later, Rapella saw that the birds looked healthier—with shiny feathers and bright-colored wattles—and that their eggs had a fuller taste. “I started wondering if I could take on more chickens and create an ‘Alpine egg’ to sell in local markets,” he says. 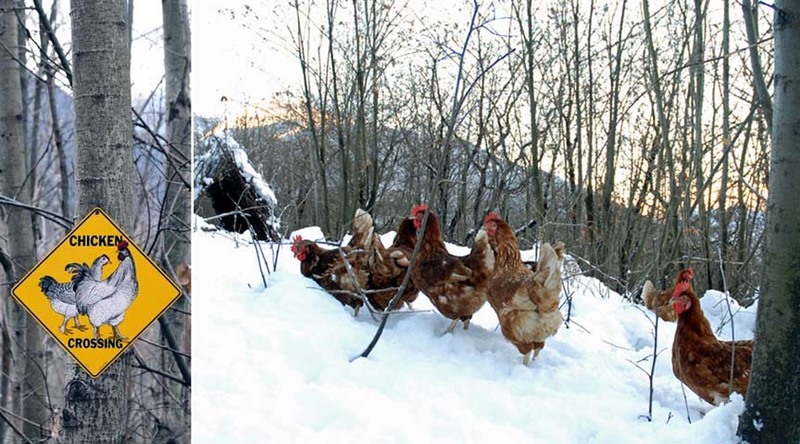 Today, he sells his uovo di selva, or egg of the woods, to about 400 direct consumers and 40 restaurants. 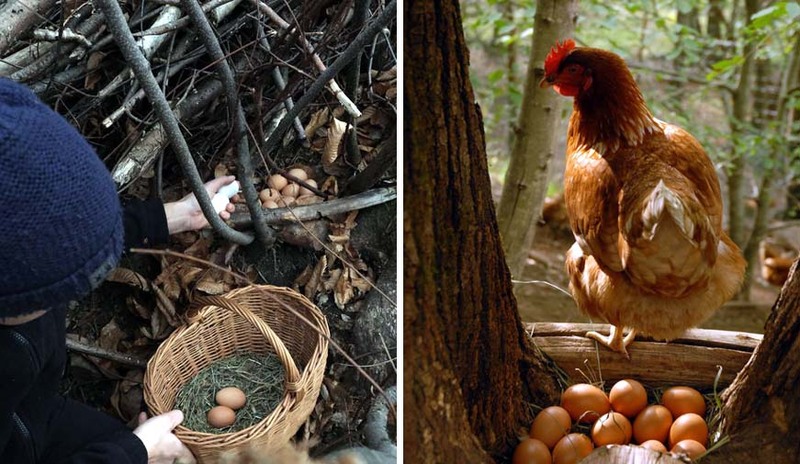 Rapella’s chickens lay eggs almost every day, like any domesticated chicken, but they do so in the woods. “They like natural nests offered by tree roots or branches,” he says. “Usually when you spot a cranny with some leaves, you know there could be eggs.” Once a hen finds her favorite nesting spot, she goes back to it for each subsequent laying, making Rapella’s egg-hunting easier. Together with two employees, he gathers an estimated 1,000 eggs every morning. While he once lost the occasional chicken, now he relies on a double fence and two trained Maremma sheepdogs to keep badgers, martens (a weasel-like carnivore), foxes, and buzzards at bay. Just wait until they get a craving for Newman. A thousand eggs a day?!? Holy cow! The only problem I foresee is that some of those eggs could go undiscovered for weeks - or months. Looks like there are roosters. Undiscovered eggs may just become more chickens. True, but typically, fully domesticated hens only become broody once or twice a year (some never do). I would guess that this guy's birds become broody even less often, as sitting on a nest on the ground for three solid weeks is a dangerous proposition when living in the wild. Even if you do have guard dogs! I suppose, when he finds a hen sitting on eggs, he brings her and the eggs into a coop of some type, so she can hatch her eggs safely. I sure would. Could ya keep that up for 2100 chickens? Can't see the forest for the trees chickens. Ya got the rooster, ya got the hen...Who's doing the chicken? Who knows! Having 2100 free-range forest chickens is nucking futz, as far as I'm concerned. You'd spend the entire day searching acreage for eggs. To hell with that! Set up an Easter-themed gift shop at the entrance, have kids hunt for eggs, redeemable for tickets towards prizes. I was reading in the business section on Friday that in the US, egg consumption is at record levels. Hasn't been this high since the 40s or 50s. Remember when eggs were evil cholesterol demons, and not to be eaten with any regularity? Around here, people are finally starting to figure out that fresh farm eggs are much tastier and healthier than massive egg factory eggs. Believe it or not, I could sell my eggs in Portland at the Saturday Market for $7 or $8 a dozen, or at the Vancouver WA farmers market, for $6 or $7 per dozen. That is, if I was interested in all the BS that traveling to and selling at the markets entails. NOT. Instead, I get together with a little collection of locals every Wednesday at nearby breakfast joints and they buy everything I have. I sell regular/large dozens for $3 and jumbos for $4. The birds are finally paying for their own keep, I get a free breakfast every week, and I get out of the house to interact with actual human beings for an hour or two. Win-win-win! Oddly enough, I very rarely eat eggs, only because they mean money in my pocket. The other day, though, I ate four small hard-boiled eggs and it was GLORIOUS! The other day, though, I ate four small hard-boiled eggs and it was GLORIOUS! I like the occasional hb egg. My thing is deviled eggs. Sadly, I've eaten them by the plateful. Now I want deviled eggs.